During a recent heavy rain fall, I noticed water leaking from our ceiling onto the bed. The water was coming from the roof, through the attic and into our room. Of course the first thing we did was to grab a bucket to catch the water. Then we went, (actually my husband) into the attic in search of the cause. We noticed the water was running down the side of a PVC pipe that vents to the outside of our home. As it was pouring rain at the time, we tried to contain the leak by taping the sides of the pipe to the roof, until we could get a better look outside as to what was causing the problem. Why Do Homes Have PVC Pipes Sticking out of the Roof? All homes have piping venting to the outside of the home. They are those pipes sticking up out of the roof that run through the attic and through the rest of the house. Plumbing vents protect plumbing fixtures. The vents are often connected together inside the attic, and vent to the outside of the home and are necessary for proper drainage of water. 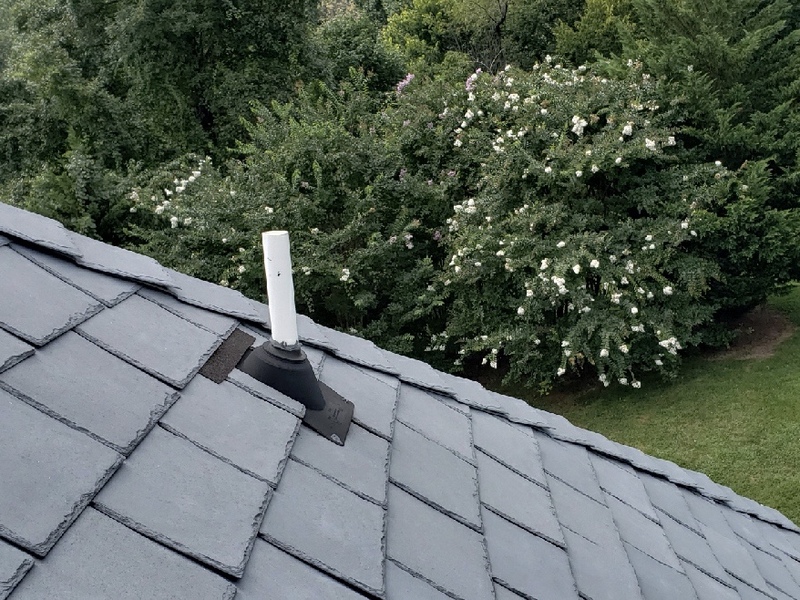 A roof can leak for many reasons, but a common cause is due to a cracked rubber boot at the PVC vent pipe. This is what happened in our home, when water starting leaking into our bedroom. As you can see from the picture, the rubber boot has cracked, most likely from sun damage, and water is seeping into the attic and through the drywall ceiling into our room. You can hire a roofer to replace the vent flashing on the roof or you could DIY the job, which shouldn’t take more than 15 minutes. But if you have a steep roof, hiring a professional is the way to go. Here are the steps to replace the roof vent pipe flashing. Pry up the roofing nails used to attach the old flashing. Gently lift up the shingles above the flashing. Lift the flashing off the vent pipe. Slide the new flashing HERE over the vent pipe. Tuck the uphill part of the flashing under the shingles. Fasten the new flashing with galvanized roofing nails. Apply a dab of roofing sealant HERE to the nail heads and bottom tabs of the shingles that were disturbed. An even simpler fix that can be done during an emergency is to install a pipe collar. This rubber boot (pipe collar) HERE slides over the PVC pipe for a water tight seal, and it requires no caulking! This is what we did to fix our leaky roof after a heavy rain storm. So far it has held up very well and has kept water out of the attic. It is recommended to use the pipe boot as a second layer of protection after replacing the vent pipe flashing. But for us, this quick fix is working out well, as we have not replaced the flashing yet. Hope you found this helpful. Have you had a leaky roof in the past, what caused the problem? Subscribe to Happy Haute Home to receive home hacks right to your inbox, and follow along on Pinterest HERE, and Twitter HERE and feel free to pin and tweet your favorite pics from Happy Haute Home.